As I’ve now been back from Vegas for longer than it is until I go again (T-8!) I should probably lay to rest the stuff have from the last trip that I haven’t talked about yet but would definitely have blogged if the crappy net access didn’t let me down. I had two tournament cashes. I already wrote about the result at Binions, but I also hit a $964 payout at Caesars Palace. This was a 12-way chop that gave everyone remaining a prize just better than the third place money. Amazingly, only eleven accepted the deal to start with. Blinds were about to double (they skip some levels in the lunctime tournament to get it over with quicker than the evening one) leaving nobody with a stack much bigger than 10 big blings. He soon came round though, and I got to experience the bureaucratic nightmare that is a Harrah’s casino poker payout of $600 or more. Form-filling-tastic. Somehow I’d lost my Total Rewards card (or at least I thought I had, it did turn up much later) whilst playing video poker at Caesars, resenting the downgrade from 9/6 Jacks or Better (99.5% payback) to a pathetic 7/5 paytable (96.1%). To get the payout from the cardroom, I needed to hand over both my ID and the players card. I tossed in my passport to let them get started on the paperwork and went hunting for the card, with paranoid visions of neither my passport nor my money being there when I got back. The card wasn’t where I thought I’d left it, so I had to beg the players club staff to give me a new one: at first they insisted I needed my passport to get it reprinted, but eventually they believed my story that I’d had to leave my ID in the poker room and just let me write my name on a piece of paper, found me on the system and asked me if the address on screen was correct. A peculiar security procedure to say the least, especially after nothing else I had on me was acceptable proof of ID - including a Visa card that has a photograph on it, that they wouldn’t even look at! I was pleased when I eventually found my old card however - it was a World Series of Poker edition card from the summer and these things matter! I did meet another English player who’d cashed in that tournament who passed on some useful information on how to be an illegal immigrant. He’d been living there for some time now with his friends who play poker for a living. He, he insisted, was not that good yet but tagged along and still enjoyed some success. "How did you get a visa then", I obviously asked. "Don’t need one mate", he replied, going on to explain that as long as you leave the country every three months you can take full advantage of the visa waiver. Nobody at the airport pays attention to when you were last here, he insisted. As I’ve been a bit concerned about my return next weekend so soon after this trip, especialy travelling alone this time and almost certainly fitting some kind of profile, this was quite reassuring. "The only thing is", he advised, "if you get into any kind of trouble they’ll try to kick you out. But we know a guy. He’ll take you Mexico for $99, then next day you can come right back". That was my largest win of the trip, and a good result at the right time really, putting me back into the black for the trip. My only other win of note was a profitable session playing $1/$2 No Limit at the Golden Nugget. Apart from one session last summer playing $1/$3 in a local’s game, which didn’t help a great dea;, I was a complete noob to this game. I played almost nothing all night, and somehow ended up leaving with $129 more than I came with after nearly six hours. I’m still unsure whether loose no-limit games could suits me – I have a long way to go to be confident enough to take full advantage of the weaker players and the donators, but at least I could spot who they were. The bigger pots I won, if I recall correctly, came from a well-timed check-raise holding only second pair – which I felt very good about – and a bizarrely played ace-jack that I might still hold back for another entry in the future. All I can think looking back on that hand is that I played it like it was limit poker, and somehow it worked. I know I have much to learn. The Nugget is actually now home to the coolest swimming pool in the world. 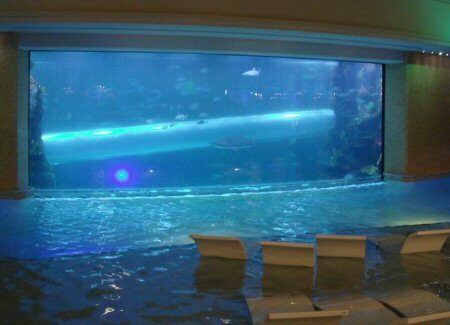 That would be because it’s got a goddamn shark tank in the middle of it! And a water slide where you go right through the sharks! On a chilly evening in December – definitely not swimming weather – the Nugget opened its doors just to show this baby off as soon as they’d finished building it. And quite rightly so. Best pool ever. I must also mention that we finally went to see Wayne Newton. I’d heard that his voice isn’t what it used to be, and they weren’t kidding. His orchestra and backing singers did a fairly good job of making just enough volume that you couldn’t quite tell how badly he was choking. There were plenty of talky bits for recovery time between musical numbers and he was also professional enough to always cough and splutter away from the microphone. It was a very odd experience to be in the presence of greatness but have to imagine what the Wayne Newton experience is actually meant to be like. He is clearly a fantastic entertainer, and still puts on a decent show, but it looks like he was way past his best several years ago. Nonetheless, it’s something that had to be ticked off the "things to do in Vegas before I (or they) die (or get eaten by a tiger)" list. So I think that’s it - that trip is finally put to bed. Until I remember something else, anyway.